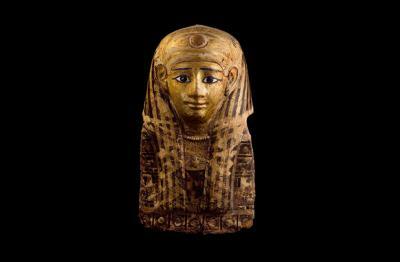 Within funeral chambers, sarcophagi, canopic jars and amulets remained in direct contact with the mummy. Around them, there could be figures of divinities, ushabtis or funeral models. Egyptian tombs can be considered veritable permanent homes for the deceased. The form and size of pyramids, mastabas, rock tombs, etc. varied as a function of the status of their owners and of the evolution of structures over time. One characteristic that is shared by virtually all funeral facilities is the existence of two areas that are perfectly differentiated from a functional and topographic perspective: the area containing funeral facilities and the area for worship. The mummy is the most important item in the funeral facilities area. It was protected by sarcophagi made using different materials and in different shapes. The possessions that accompanied the deceased included amulets of all types to guarantee the well-being of the deceased in the afterlife. Canopic jars, ushabtis, representations of funerary divinities, models of events on Earth, food, etc. are the objects most commonly found in the sepulchral equipment of pharaonic tombs. 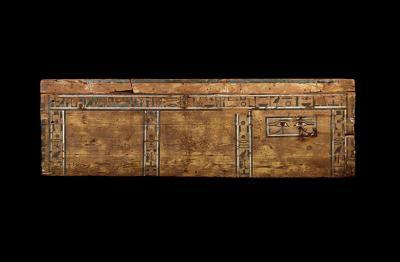 Coffin of the priest Cnumhotep. Wood. 12th Dynasty (1991-1783 B.C.). The coffin in a parallel position is characteristic of the Ancient and Middle Kingdoms and of the royal tombs of the New Kingdom. This example contains hieroglyphic text addressed to Osiris and Anubis that require a complete complement of offerings from the priest Cnumhotep. The eyes on one side allowed the deceased to observe what was happening in the outside world. Painted coffin made from rendered wood. Late Period (715-332 B.C.). In view of its size and the absence of a false beard, it could be the coffin of a child. Special mention must be made of the preservation of elements used to fit both parts of the piece, as well as the presence of remains of the bandaging of the mummy. Funeral mask. Cartonnage. 1st century B.C. The funeral mask covered the head and torso of the mummy. Its main purpose was to facilitate the identification of the deceased using the reproduction of their facial features. Above them there are also various ornamental elements and protective divinities. Ushabti of the “Priest of Amon”, Amenemopet. 21st Dynasty. 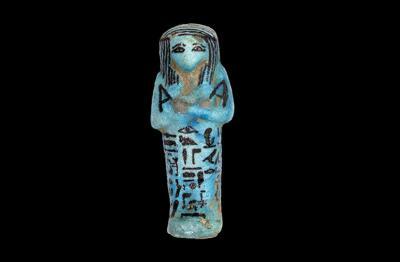 The ushabti is a small human representation of various styles and shapes made using a variety of materials. It was placed in the tomb so that in the Afterlife, the work for which the deceased was required could be completed. 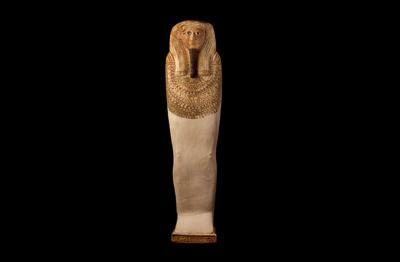 The word “ushabti” means “he who responds”. Thus, when the deceased was called to work the ushabti was supposed to answer “Present” and, therefore, could replace them. In order for the figure to be able to return to fulfil their obligations, some examples contain a version of chapter six of the “Book of the Dead”. Funerary model. Painted wood. The Middle Kingdom (2040-1640 B.C.). 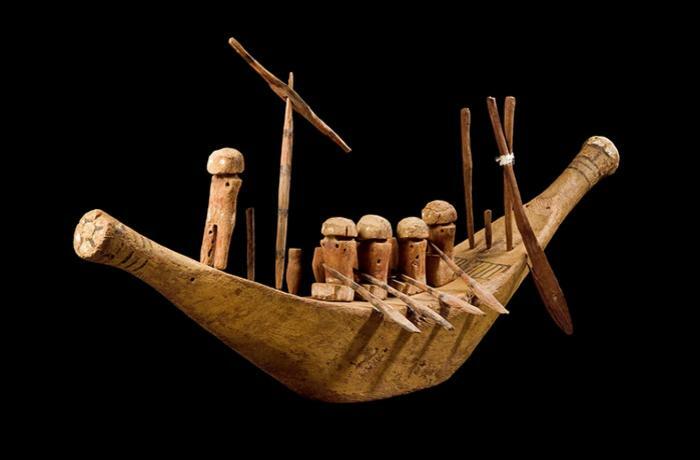 Models that depict numerous everyday activities were widely used during the First Intermediate Period and the Middle Kingdom. Its sole aim was to perpetuate the most notable aspects of life on Earth for the deceased. The contents of the tombs include different types of model ships.